Crock-Pot vs Instant Pot: Which one is right for you? The battle royale of the electric cookers. Some home cooks like it low and slow, others have the need for speed. Who will win the battle of the electric cookers in Crock-Pot vs Instant Pot? No, this showdown won’t come close to classic bouts like Godzilla vs. Mothra. But just about everyone and their grandma has strong opinions on what electric cookers belong in their kitchens. Below, we profile our combatants and try and figure what the best cooker is for your particular needs. Originally, this thing was sold strictly as a bean cooker. It cooks pintos and garbanzos well to be sure, but it does so much more. Slow cooking has never had a better poster boy than this foolproof kitchen appliance. Drop food in, plug it in, and in the evening when your dogs are barking, dinner will be waiting for you. It also stinks up a kitchen real nice with the aromas of cowboy pot roast, bolognese, chicken tikka, and other intoxicating smells. And when dinner is over, simply slide the removable ceramic insert in the dishwasher and it’s ready to use over and over. The tech here hasn’t changed since its groovy origins. The stoneware cooking vessel conducts heat perfectly. The lid lets you see your tasty food simmer to perfection. 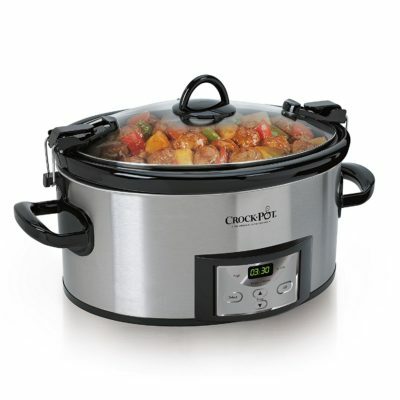 And unlike the shoddy ones from This Is Us, newer Crock-Pots are safer than wading in a backyard kiddie pool. Leave it on before you go to work, and rest assured that you won’t return in the afternoon to your home ablaze. Plus, they’re cheap as heck. Even the higher end fancy models top out at around $40. Once you buy it, it’s yours for life. Again, the tech is mostly unchanged so don’t expect it to break down out of nowhere. Pressure cooking isn’t new, but easy AF pressure cooking is. Stovetop models are cumbersome, clunky and not exactly user friendly. The Instant Pot is just as user-friendly as a Crock-Pot, but cooking in it won’t require hours. Slow cooked goodness can be had in minutes. Pulled pork, Korean short ribs, chili con carne, and even cheesecake can be had out of this pan and it won’t make you wait for it. You can even make bone broth in a fraction of the time it would take on the stove or slow cooker. It steams, it pan fries, and makes fluffy white or brown rice in less time than it takes to reach for a takeout menu. And here’s the kicker: the Instant Pot has a slow cooking function. If you own an Instant Pot, you kind of already have a Crock-Pot. Granted, you won’t be able to add ingredients once the cooking has begun. You also won’t be able to gaze lovingly at your dinner as it cooks. Them’s the breaks. In the end, the noble Crock-Pot can’t hold a candle against the Instant Pot. It’s a sturdy, salt-of-the-earth workhorse, but the Instant Pot is simply far more versatile. However, the versatility comes at a steep price. The least expensive models will still run you about $60. That may be more than you want to invest in a countertop cooker at this time in your life. Rest assured, there’s no shame in sticking by the Crock-Pot. Every church lady on earth depends on it when it comes to not only making tasty foods, but keeping them warm. And at prices starting as low as $10, it’s within reach of any cash-strapped budget.